In an earlier post I wrote about my TG Green Streamline collection. I thought it might be time to introduce my other TG Green collection: Cornish Kitchen Ware. We covered a brief history of the TG Green Pottery in the previous post so I won’t go over that again. But the Cornishware story is interesting in its own right. 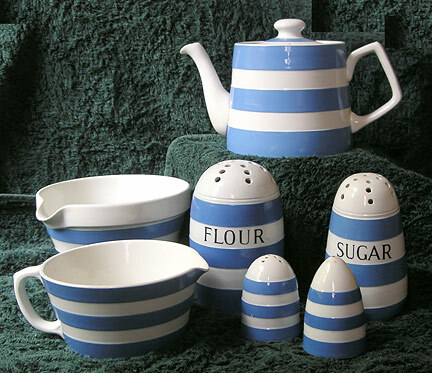 Supposedly named by a TG Green Regional Sales Representative who was inspired by ‘the blue of the Cornish skies and the white crests of the waves’, Cornishware is the most famous of all the TG Green lines. It is the definitive blue and white kitchen ware pottery of the 20th century (Willow pattern doesn’t really count as it is primarily used on dinner wares rather than than kitchen ware). When the popularity of Cornish Kitchen Wares took off it spawned dozens of ‘me too’ lines from competing manufacturers: Kleenware, Fowlerware, Stanley Ware, Bretby Ware, to name a few. But none of them really captured the market like Cornishware. Blue banded white wares had been around since the mid-Victorian years and there’s no record of who at TG Green came up with the idea of turning this type of pottery into a modern range of kitchen wares. It is believed that the idea was driven by the need to give the TG Green lathe turners employment in the mid 1920s during the post WWI recession. A Pottery with a background of social conscience. Gotta love that! The Cornishware pieces are fired, coated with slip which is allowed to dry and then coated with the blue slip. When this is dry the pieces are mounted on a lathe and bands of blue slip are turned off to reveal the white body beneath. Then of course they are fired again. This also gives the pieces their texture as they have a very definitive edge to them; not achievable by just painting the stripes onto the body. This hand lathe process is still carried out today in the modern Cornishware pieces. Over the years Cornishware has been made in several colourways: yellow (Sunlit Yellow), buff (Cornish Gold), red, black, green and teal. My collection focuses on the original blue range with pieces mainly from the 1930s and 40s; although I have a teapot from the 1960s when the range was redesigned by Judith Onions in an effort to modernise it and revitalise its market appeal. I’m especially fond of the flour and sugar shakers which still have their original rubber stoppers in the bottom. And the sauce boat (front left) which is hard to come by. I still buy the occasional piece of Cornish ware (the pepper and salt shakers were a fairly recent addition to the collection) but, to be honest, I’ve currently shifted my collecting focus more to the Streamline collection. You say that Bretby Ware came about in competition with Green’s Cornish Kitchen Ware. My mother worked at Bretby pottery when she left school as a dipper (dipping the white ware into blue slip prior to firing and glazing). She always said that the process – white pot, blue slip layer on the outside, firing, making white lines on a lathe, then glazing was invented by Tooths, and copied by Greens. A number of my aunts on both side of the family also worked at Tooths and said the same (though I can now only offer hearsay evidence). Is there any way of finding out if this is true? I shouldn’t think so Michelle. My information comes from reading books and articles about TG Green. I don’t have any personal history with the pottery. Unless someone has written a book on Bretby Ware I guess we’ll never know.